Way to go! 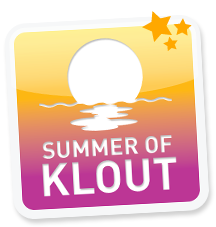 Your Klout Score braved the dog days of summer and still came out on top! Maybe it's time for a vacation? This made me chuckle, because if one thing is true about my Summer it is that I didn't brave the dog days, not at all. Instead I vanished into the haze that those few lucky enough to be cured of pancreatic cancer can vanish into. Part physical, part psychological, it's a kind of Never-Never Land - or, more accurately maybe, a Sargasso Sea, a zone characterized by the calm winds of the horse latitudes. So, no matter what Klout may say to the contrary, this was for me a summer of seaweed rather than sagacity...and I apologize to those who were expecting me to show greater resilience to my chemotherapy. No one has been more surprised than me. I am certainly not out, but it would be wrong of me to pretend that I'm not down. I'll come back fast, I always do; but it may not be till the final doses of Gemcitabine have been injected into me in the epic half-hour infusions that come twice every three weeks to crush my white cell production and, along with it, that of any would-be neoplasms. "Better safe than sorry," that's all one can say. Along with, "Roll on, 9th Cloud Expo!" - because by then, I will be free and clear of chemistry and cytotoxins will no longer be mixed in with my bloodstream. I - quite literally - cannot wait.